Welcome to Viks Fairytale Park! The purpose of "VIKS FAIRY TALE PARK" is to promote creative thought in young children, and to acquaint them with literature that is written specifically for them. By engaging the child's imagination, it offers an alternative to technologically-produced visual entertainment that increasingly permeates classrooms and occupies a young person's leisure time. Viks' fairy tale characters have fascinated both children and adults since the 1980's. Viks is the recipient of numerous literary honors and prizes, and in 1987, his "Zemudens Bara Liela Diena" received special recognition. Latvia's first full-length animated film is based on this work and was shown in the United States. Because Viks' children's poetry and fairy tales contain ethical content and a high level of literary merit, it is required reading in school curriculums and very frequently anthologized. What can be seen in Viks Fairytale park? Brothers’ Rurans’ handmade wooden figures representing Viks fairytale personages are not the only attraction worth seeing in Viks Fairytale park. 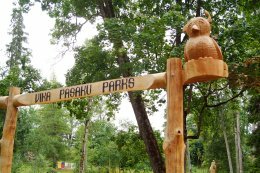 After a walk along the Park’s gravel paths visitors are welcome to the picnic corner bordering on Park’s territory, with a variety of wooden installations for children to have fun there. In the park itself you will find 28 Viks fairytale personages including Ness and Nessie, Complicated Sparrow and others. According to many visitors’ opinion the favorite top three are: Mud Dwarf, Changaroo and Heron. How to find VIKS FAIRYTALE PARK? Viks Fairytale Park is located in Dikli Village, Valmiera district, just opposite Dikli mansion gate. On route from Riga to Valmiera via Rubene take a left turn to Limbazi and after 15 km drive there is a sign Dikli 10 km on the highway’s right side. Follow the road till you arrive at Viks Fairytale Park which is seen on the left as soon as you cross a bridge at Dikli post Office (Dikli mansion is on the right). Traveling from Valmiera via Zilaiskalns you have to cover 22 kms before reaching Dikli. Arriving there you will see a building on the left in wich the culture center is housed. Viks Fairytale Parks right beside it. For more detailed information regarding excursions consult "Contacts"